Multiple devices, one big screen? With one-touch wireless connection, BYOD sharing is easy. Bring Your Own Device (BYOD) is no longer the exception in business, it’s the rule. Whether you’re presenting, pitching or just sharing in meetings, you want to bring your own device – and you want to connect easily and seamlessly to meeting room screens with no need for wires, passwords or IT support. With Avicom’s range of top-specced wireless presentation systems, pairing your PC, Mac, iPad, iPhone or Android-powered device with screens, is as simple as click and connect. Show static screen content – from PDFs, to pictures, to screenshots. Show videos. Stream sound through meeting room audio systems. Do it all, wirelessly and instantly, with Barco, Kramer and wePresent technology. These intuitive devices dynamically optimise feed for your hardware, there’s no longer any need to change screen resolution or any of your device settings. Multiple users are also able to display their screen content simultaneously, creating a shared workspace for real team collaboration in real time. Embrace the BYOD revolution. Connect multiple users to your big screens wirelessly, instantly. More ideas on the table, more people talking. Now that’s a good thing. Kramer’s VIA Connect, VIA Connect Pro and VIA Collage connects from four users to as many as 12 simultaneously. A value-oriented, wireless collaboration hub that can tile up to four users on a single screen and allows any attendee to act as the main presenter. Share files, chat with other attendees and collaborate together on a shared document using a whiteboard. Kramer’s most powerful and advanced collaboration hub. Simultaneously show six people’s screens on a single display. 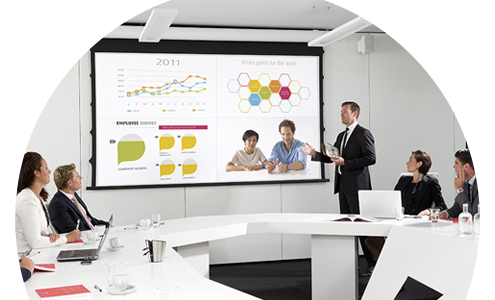 Barco’s award-winning ClickShare wireless presentation system makes meeting, showing and sharing easier than ever. A stand-alone wireless presentation system for small meeting rooms, the CS-100 allows up to 8 users to connect. It effortlessly links to laptops via USB and mobile devices via an App – perfect for BYOD meetings. Share your laptop and mobiles devices on a big screen in just one click. The CSE-200 is the answer to BYOD for small to medium-sized meeting rooms. It’s API makes integration into company networks a breeze. A leader in the wireless presentation market, Taiwan-based wePresent offers full HD support on PCs, Macs and mobiles devices. BYOD meets wireless projection. Connect any laptop, Android or iOS device for big-screen sharing and presentations. This is collaboration made simple with up to 64 users able to connect to the wePresent gateway.